Karaite philosopher and poet; born in Babylon; a contemporary of Saadia. He corresponded with David al-Muḳammaṣ, whom he had met in Babylon, on philosophical subjects, and perhaps also regarding the Karaite "sheḥiṭah." Subsequently he went to Alexandria, whence he wrote to the Karaite community at Cairo asking aid. In his letter he touched also on philosophical topics, and quoted the Karaite philosopher Joseph al-Baṣir. Leaving Alexandria for Cairo, Menahem continued his correspondence with David al-Muḳammaṣ; for, although the latter was living in the same city, Menahem was restrained by poverty from approaching a man of such prominence. In one letter, written at Cairo, Menahem explained to David, in answer to the latter's reproach, that he believed both in the creation of the world and in the heavenly bodies. Aside from the rules for slaughtering, written in verse, three of Menahem's piyyuṭim have been preserved in the Karaite siddur. 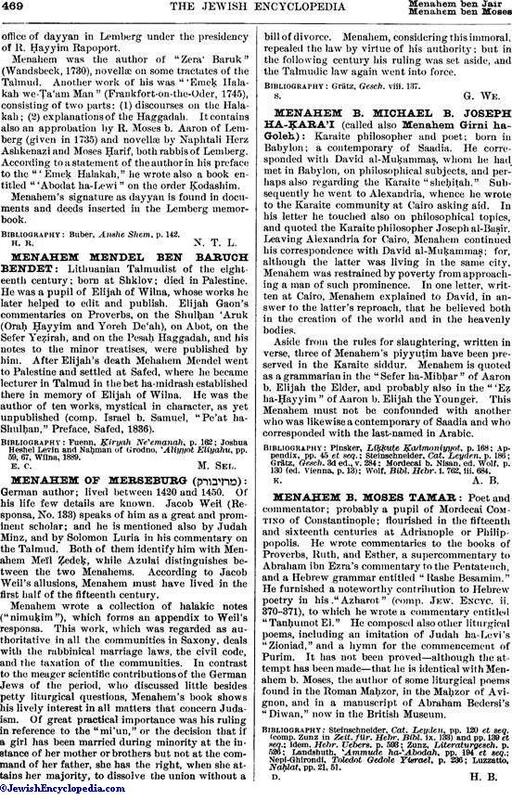 Menahem is quoted as a grammarian in the "Sefer ha-Mibḥar" of Aaron b. Elijah the Elder, and probably also in the "'Eẓ ha-Ḥayyim" of Aaron b. Elijah the Younger. This Menahem must not be confounded with another who was likewise a contemporary of Saadia and who corresponded with the last-named in Arabic. Wolf, Bibl. Hebr. i. 762, iii. 684.